Although summer sets the mood for holidays, sunsets and beach-side picnics, it also gives a burning sensation throughout the body and home interiors. The good part is, there are ways to get away from these uncomfortable situations caused due to the Sun on body and interiors. Such an ultimate solution for blocking the harmful radiations from the Sun is window film. This protective film for windows is ideal for use in the home, offices, hotels, hospitals and other commercial places where the place is under constant exposure to the scorching sun rays. It is basically a thin layer of vinyl or polyester film designed for application over the surface of window glass as an economical option to minimize the heat absorption, glare and energy consumption on cooling whilst maximizing privacy and elegance. Moreover, it also helps to prevent accidental shattering and cracking of the window glass against minor impacts. In this blog, we are going to provide you a detailed explanation of window films, their types, and benefits to make your shopping easier. There are some of the factors that need to be considered before buying window films. These films come in different kinds such as anti-glare film for windows, architectural film, decorative film and safety film. Here is the guide to choose the best window film as per your requirement. Heat/Light Protection: Normally most of the films offer some level of protection against heat and light at the installed places but still anti-glare window films are best-suited for this need. Security: Safety film is ideal for protecting the window glass against shattering. It is also designed to provide the utmost level of protection to the interiors against intruders. Decoration: Commonly known as decorative window film, it provides an excellent level of stylishness to the interiors & exteriors due to its stained, etched, frosted, or textured styles. Privacy: Available with the same name, privacy film offers excellent level of privacy based on lightning conditions in the installed places. Utmost blocking of the harmful UV rays and associated heat. Enhanced level of privacy and security. 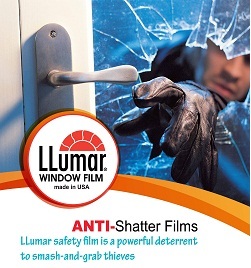 Prevents cracking and shattering of windows against lower impacts. Protection to interiors and furniture against premature fades. Reduced energy consumption on air-conditioning. Pays for itself within 2-3 years due to money saving on energy consumption. Enhances the persona and appearance of interiors as a decorative element. It was all about relaxing at your places without worrying for those scorching heat and glare or peeping from the outside. So, what are you up to? Get the best kind of window film for your glass window for a comfortable day. Jemimma Richardson is a renowned educator of window films, solar shades, blinds and associated kinds of light-blocking solutions. She is also known as a consultant for major industries that are looking for an effective solution to prevent excessive sunlight and glare. Currently, She is linked with the world’s most renowned company, Window-Cool as a senior consultant. Imprecise Article, I suggest every one to use window film for their Home, Office as well Car. It give Safety to your Property also have many benefits. thanks you share this valuable information.